Being the daughter of a well-known painter, Yung-Kuei (Sam) Lee, Kim learned to appreciate art at a very early age. She received her Bachelor's degree in Fashion, then continued her education and received her Master's degree in International Business. 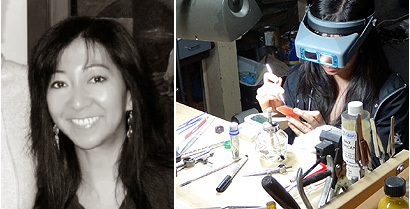 For many years, Kim enjoyed making jewelry as a hobby. Combining her artistic and design background with her business skills, Kim turned her hobby into a thriving business. Her handmade jewelry has been purchased by customers from all over the world (4 continents, 26 countries and counting), has been featured in Huffington Post and several issues of Lucky Magazine, Fashion Credited in InStyle.com, and has been spotted on prime time TV shows over 250 times. Her TV show and Film clients (past and present) include "Desperate Housewives", "Cougar Town", "Grey's Anatomy", "90210", "Happy Endings", "Revenge", "Scandal", "The Crazy Ones", "Entourage - The Movie", "Ride Along 2 Movie", "Agents of S.H.I.E.L.D. ", "Jane The Virgin", "Crazy Ex-Girlfriend", "Transparent", "Mom", "Middle School Movie", "Hail Mary", "White Famous", "How To Get Away With Murder", "Riverdale", "Dynasty", "The Resident", "Hell Fest Movie", "All American", "Hawaii Five-0", "Shaft Movie", "For The People". Kim’s jewelry has been described by her customers as “gorgeous”, “beautiful”, “stunning”, and “breathtaking”. Her designs range from chic classic styles to original creative designs you won’t find anywhere else. In addition to creating beautiful, quality jewelry, Kim believes in giving back. 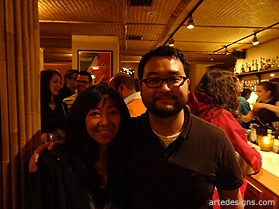 With your help, she was able to donate a portion of her proceeds from the 2001 Santa Clara Art and Wine Festival to the N.Y. Firefighters 9-11 Disaster Relief Fund. Kim also donated jewelry to BD&A 2007 and 2008 Spring Fling, where all of the proceeds benefit the Marsha Rivkin Center for Ovarian Cancer Research. Personal donations have also been given to Stand Up To Cancer in memory of her father. With your help, she will continue to make cancer awareness jewelry and donate 100% of the net proceeds to the Stanford Comprehensive Cancer Center at the end of every year. Her yearly contributions will go directly towards cancer research, education, and new treatments for all different types of cancer. Most recently, Kim designed a sterling silver safety pin necklace. At the end of every year, 100% of the net proceeds from this necklace will be donated to The American Civil Liberties Union (ACLU), which is a nonpartisan, non-profit organization. 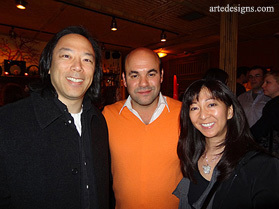 Click here to see Kim in a photo with Greg (who has helped create Arte Designs) and Actor Ian Gomez from TV's "Cougar Town"
About The Designer Kim Lee Ozawa - Arte Designs.